I started playing Tom Clancy’s The Division is in beta the weekend of 2/19. I don’t know if they will open it up again before the March release of the game, but this profile should work once the game is released. The game itself seems entertaining enough. The story so far makes sense and offers base playability. I didn’t get to play with a crew, which seems to be where the game gets really interesting and in the dark zone. The open question still is once the game is released how much griefing will be done in the Dark zone and will it actually be fun to play or just frustrating for new players who get griefed by long standing players? 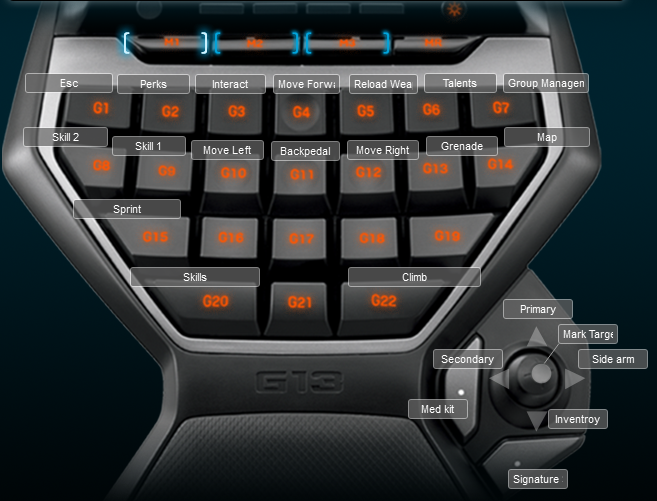 I created a Logitech G13 profile because it is what I do at this point it is easier to create one than search for one. Because the game is like an RPG and there are skills the layout for the keyboard is a bit different. I put the skills to the left of your normal WASD keys and then the medi kit on the first joystick button. I did this because as I played the game the med kit wasn’t used a lot in the beginning. As I play more I might consider moving the med kit because it seems to be used more than skills when in combat. I kept the mouse layout the same as I always do with melee and jump on my extra buttons. Below is the image of the keyboard layout.